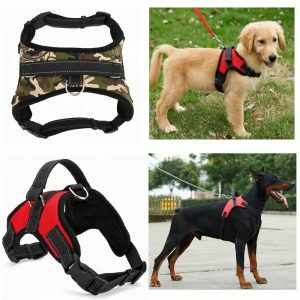 Recently, harnesses have become very popular and for good reason. That’s not to say that harnesses are superior to collar leashes. There are advantages and disadvantages to both as you would expect. So let’s cover some of them here. Firstly I’d recommend purchasing a good collar as well as a harness and alternate between the two when taking your puppy for a walk. 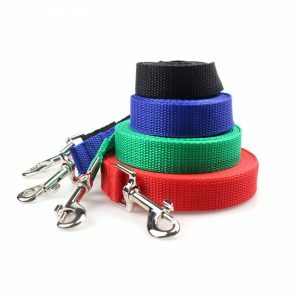 This is to get her accustomed to both collar and leash at a young age. 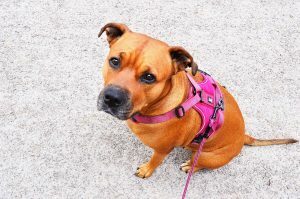 Getting them to accept a harness for example will be more difficult as harnesses can be more intrusive on a dog. For example my puppy was never introduced to a harness and getting them into one now is almost difficult at the best of times. I think the number one reason to use a harness is not to hurt your dog needlessly. As described earlier I had my pup on a leash from day one and to make it worse it was a retractable leash. He had a habit of chasing birds during our walks. We would be walking causally along and suddenly he would spot a bird grazing in the nature strip and he would take off like a rocket. Now, you can guess what happened next. The retractable leash would reach it’s limit and he would be whip lashed. I solved this somewhat by getting a non-retractable leash. If he did chase anything he couldn’t build any momentum to hurt himself. Teaching him to accept a harness and be comfortable with it would have been the ideal situation. I did eventually buy a harness for him and found I had more control when I needed to direct him a certain way. Alas he was never fully accepting of the harness. The good news is he has since stopped chasing birds but instead gives them a stern looking as we walk by one. We must mention also that it does take that little bit longer to put a harness on. It’s so much simpler to clip the leash to the collar and off you go. For a well trained dog that needs a quick walk I would recommend a leash any day. It’s very much a case of horses for courses, there is no right answer. We know that our furry friends come in all shapes and sizes. Each of them have their own wants and needs. My final recommendation would be to have both a collar leash and harness. And get them comfortable with either one when they are pups. Use the one that gives you and your pup the best experience.